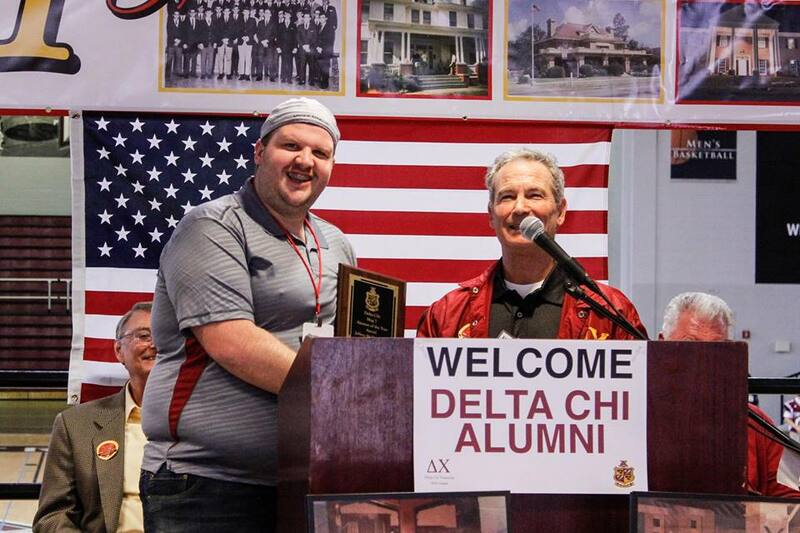 Active Chapter “BB” Jeff McDurmont presents Rob Ackerman with the “Alumni of the Year award” at the 2018 Delta Chi Alumni Homecoming Reunion. Mike Kreis presents a $1000 “Sons and Daughters of Alumni Brothers” scholarship certificate for Fall 2018 to Sarah Mitchell Wagoner during the 2018 Troy Delta Chi Alumni Homecoming Reunion. 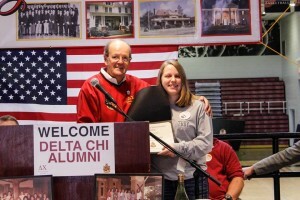 Sarah Mitchell is the Daughter of Brother Ira (DC 1974) & Sarah Wagoner of Selma AL. 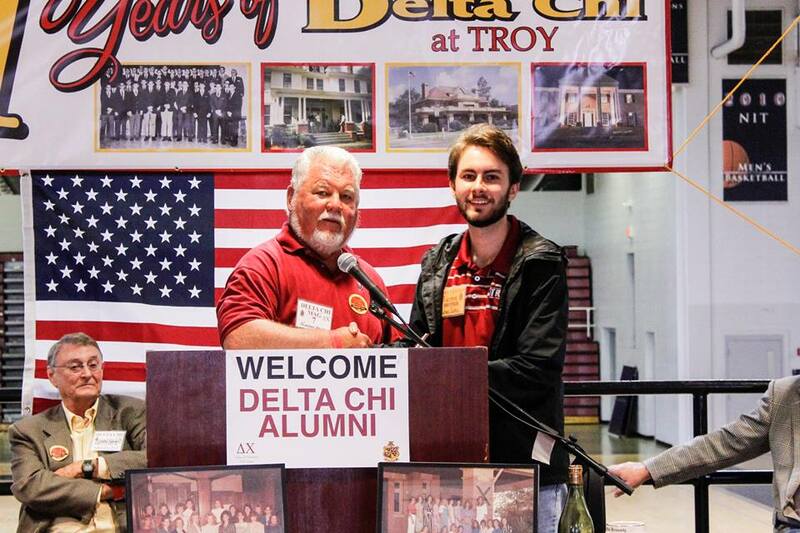 Mike Kreis presents a $1000 “Sons and Daughters of Alumni Brothers” scholarship certificate for Fall 2018 to Kenneth Neil Amison during the 2018 Troy Delta Chi Alumni Homecoming Reunion. 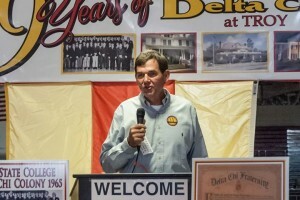 Kenneth is the Son of Brother Mike (DC 1983) & Starla Amison of Elba AL. 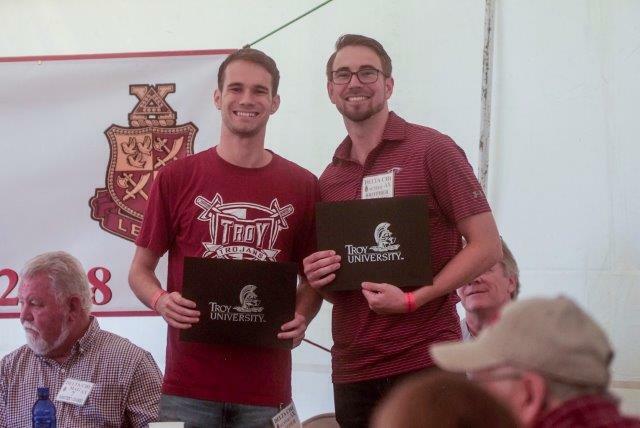 Jonathan Gray & Austin Leibach accept $600 scholarship certificates from the Troy Area Delta Chi Alumni Chapter for having the highest GPA for the Fall 2017 semester. 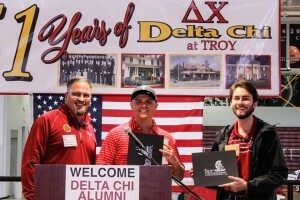 They tied with a 4.0 GPA. Austin also won the $600 scholarship for having the highest GPA for Spring 2018 semester. 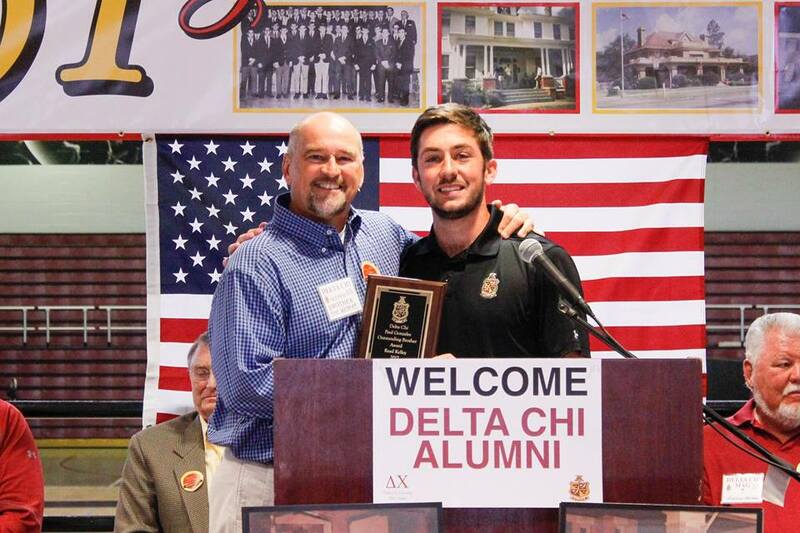 Active President Luke Herndon accepts the “Paul Gonzales Outstanding Brother of the Year” award from Alumni Brother Andy Whitaker during the 2018 Troy Delta Chi Alumni Homecoming Reunion. 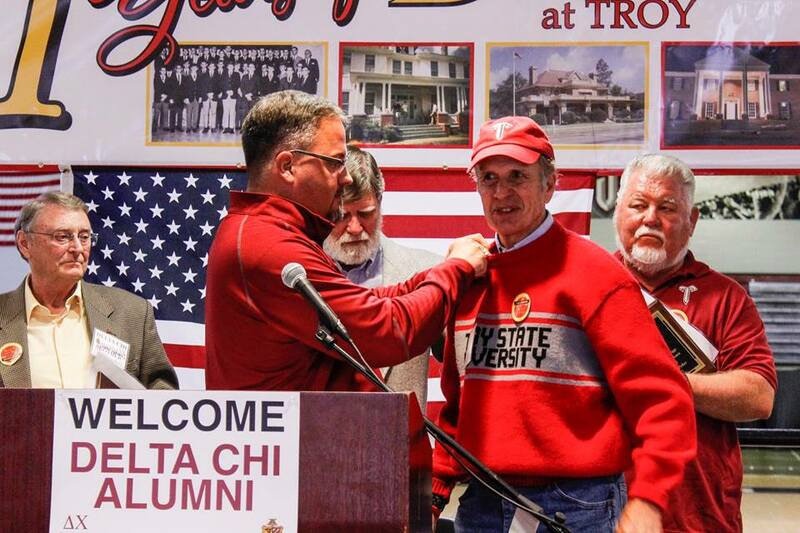 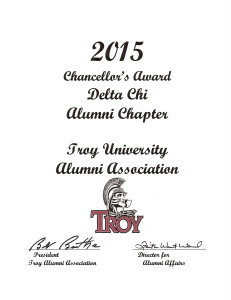 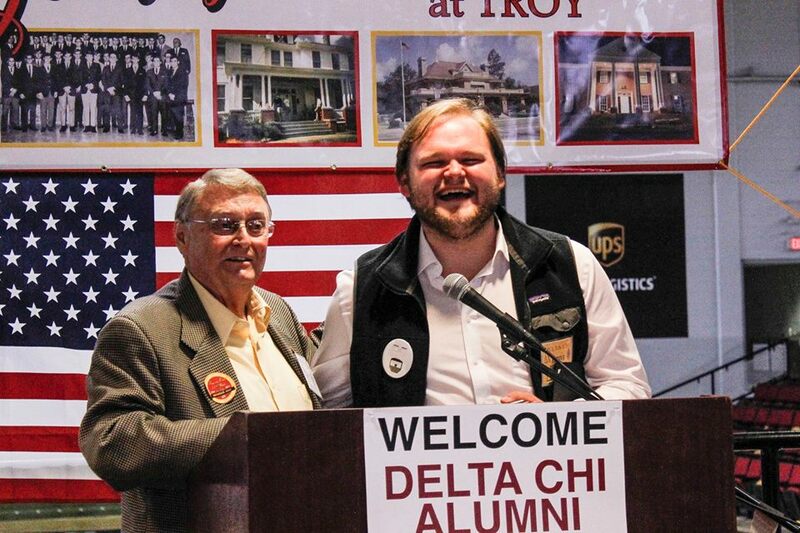 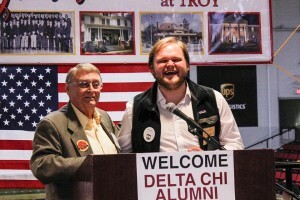 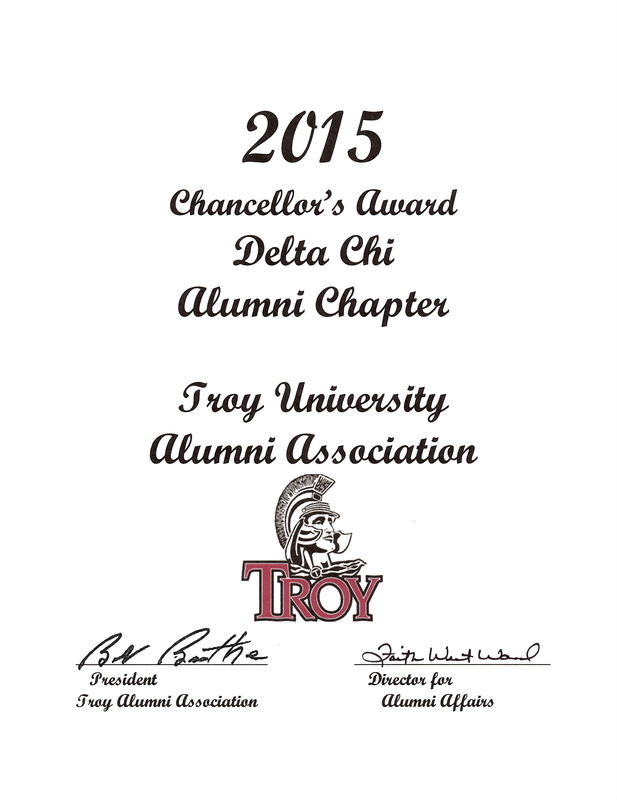 Wallace Hill presents Lawson Parker with the “Wallace Hill Best Pledge Award” during the 2018 Troy Delta Chi Alumni Homecoming Reunion. 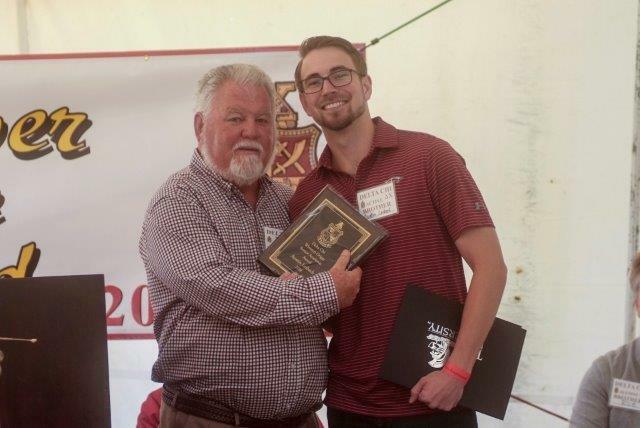 Winston Griggs presents Austin Liebach with the “Senior Academic Award” (Active Senior with the highest overall GPA) at the 2018 Troy Delta Chi Alumni Homecoming Reunion. 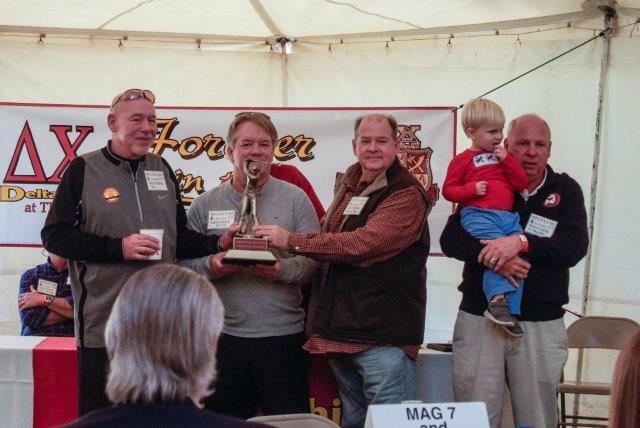 Rob Ackerman presents the Annual Floyd Johnston Golf Trophy to team members Tully Burnett, Freddie Teal and Ira Wagoner. 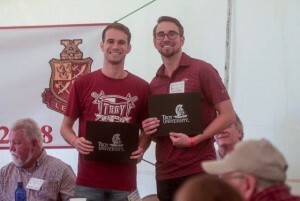 Their teams tied for the win. 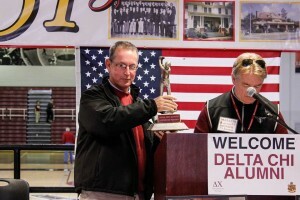 Rob Ackerman presents the Annual Floyd Johnston Delta Chi Golf tournament trophy to team captain Danny Lee. Other team members (not in picture) were Tim Archer, Ricky Douglass, and Lindsey Lee. 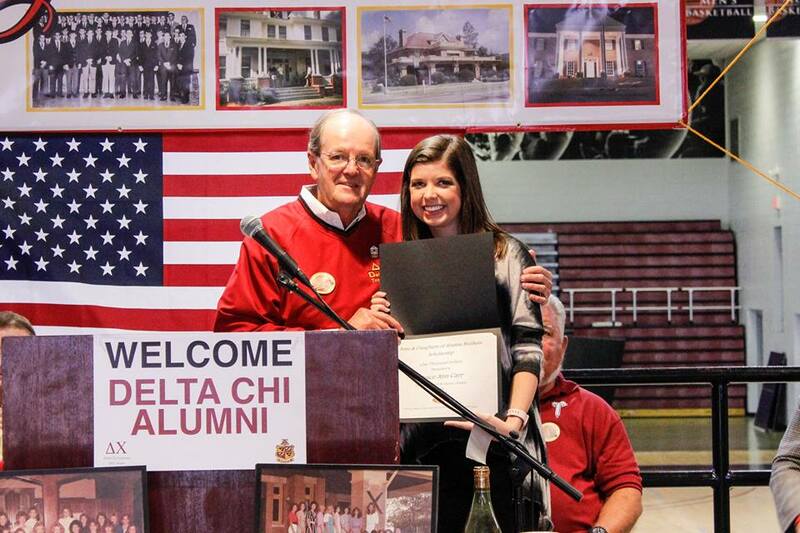 Steve Campbell presents $1000 “Sons and Daughters of Alumni Brothers” scholarship certificates for Fall 2017 to Gracie Carr (Top) and Riley Holman (Bottom) during the 2017 Troy Delta Chi Alumni Homecoming Reunion. 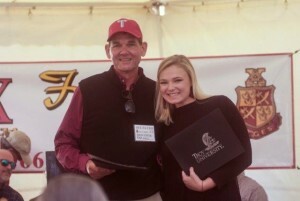 Gracie is the Granddaughter of MAG 7 Tommy & Gayle Nichols. Riley is the Daughter of Brother Keith & Melissa Holman. 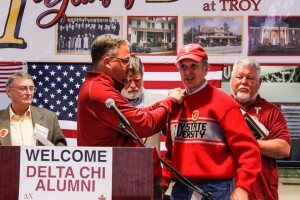 Bobby Dewrell Presents and pins the “Men at War” pin from DC IHQ to Brother Rick Stetson for having been deployed into an active theater of war during his time of military service. 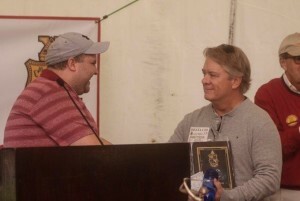 Thank you for your service Rick. 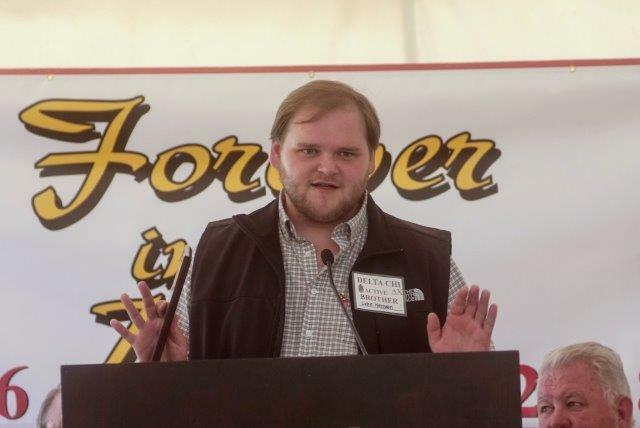 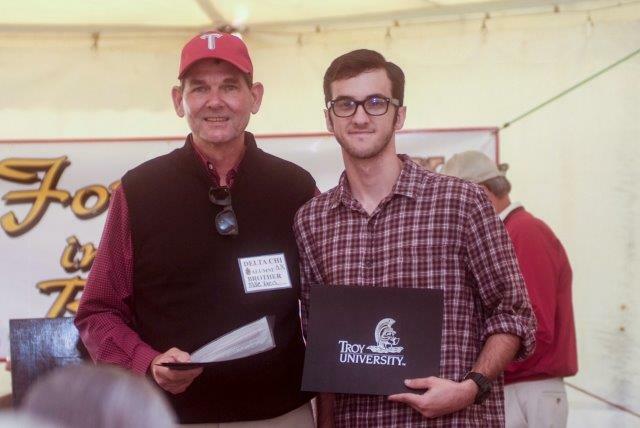 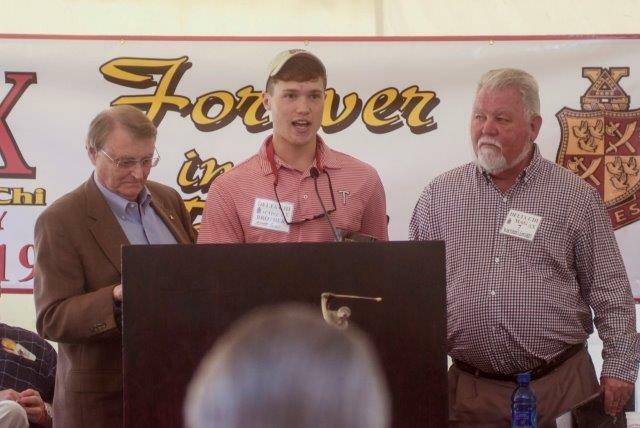 Winston Griggs presents Matthew Parker with the “Senior Academic Award” (Active Senior with the highest overall GPA at the Troy Delta Chi Alumni Homecoming Reunion. 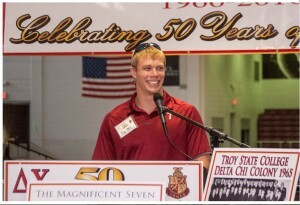 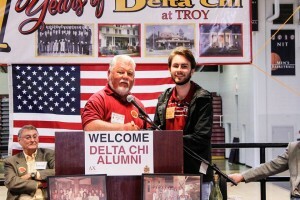 Wallace Hill presents Luke Herndon with the “Wallace Hill Best Pledge Award” during the 2017 Troy Delta Chi Alumni Homecoming Reunion. 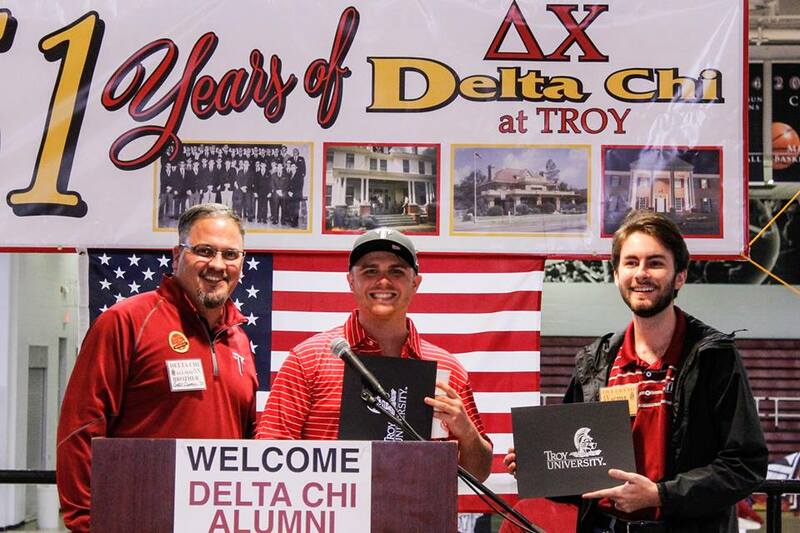 Bobby Dewrell presents Active Brothers Kristopher Pickens and Matthew Parker with a $600 scholarship certificate each for having the highest GPA for Spring 2017. They both had a 4.0 GPA. 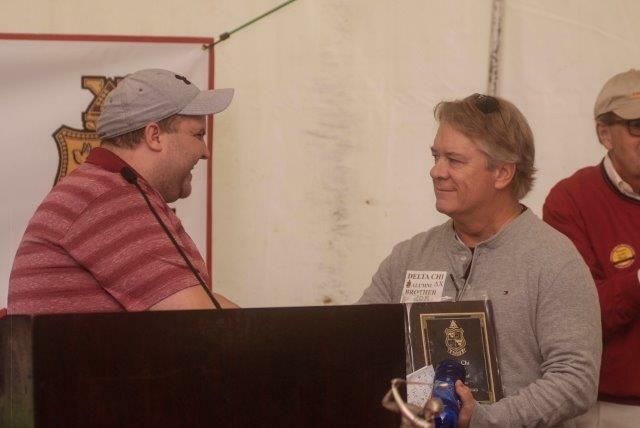 Andy Whitaker and Jeff Leukel (not in picture) presents Reed Kelley with the “Paul Gonzales Outstanding Brother of the Year” award during the 2017 Troy Delta Chi Alumni Homecoming Reunion. 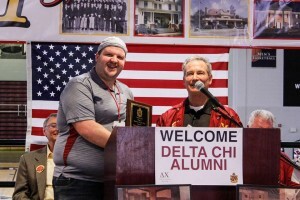 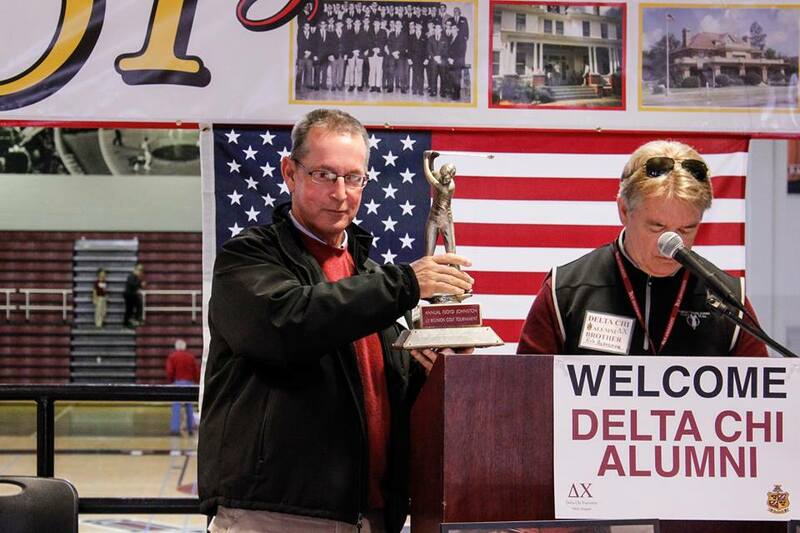 Alumni Chapter President Mark Kelly presents Active Chapter “BB” Jeff McDurmont with the “Alumni of the Year award” at the 2017 Delta Chi Alumni Homecoming Reunion. 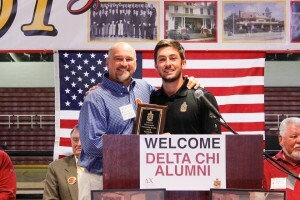 Trey Hock DC 2012 accepts the “2016 Paul Gonzales Outstanding Brother Award” at the 50th reunion. 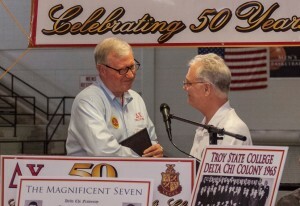 Mike Kelly DC 1968 (right) presents the “Lifetime Achievement Award” to John Ferguson DC 1967 at the 50th anniversary reunion. 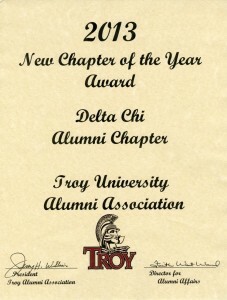 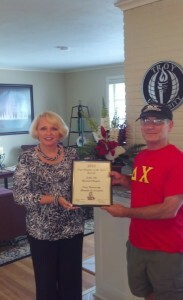 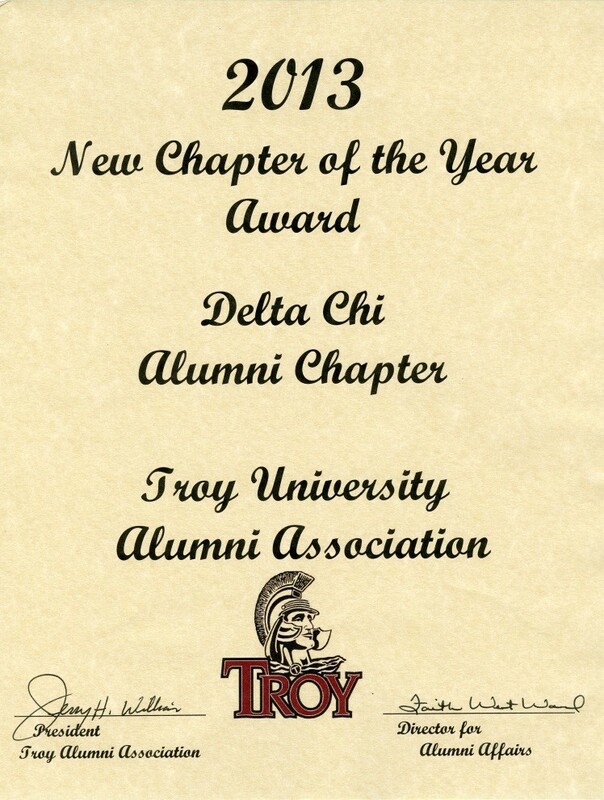 Alumni Chapter President Mark Kelly Accepting The 2013 “New Chapter Of The Year Award” From Troy University Director Of Alumni Affairs, Faith Ward.